Network effect-based moats are the strongest forms of competitive advantages. These moats exist when the value of the product or services increases for all users as more users use it. While platforms are at the heart of such moats, it is important to note that not all platforms make for moats. Neither do all networks give rise to network effect-based moats. We discuss network effects as a source of competitive advantage and lay out our framework for analyzing such moats. Advertisers preferred the paper with the most circulation, and readers tended to want the paper with the most ads and news pages. This circularity led to a law of the newspaper jungle: Survival of the Fattest. Thus, when two or more papers existed in a major city (which was almost universally the case a century ago), the one that pulled ahead usually emerged as the stand-alone winner. After competition disappeared, the paper's pricing power in both advertising and circulation was unleashed. Typically, rates for both advertisers and readers would be raised annually - and the profits rolled in. For owners this was economic heaven." Though in today's technology-enabled era, the way information and news are disseminated has changed from newspaper to search engines, social media, etc., Buffett's quote on newspapers illustrates the influence of network effect. This is the seventh article in our series of articles on analytical framework for analyzing moat businesses. In this article, we discuss network effects as a source of a sustainable competitive advantage and discuss our analytical framework for analyzing such moats. 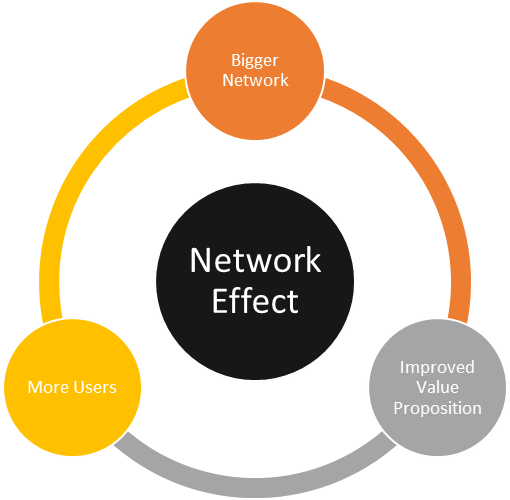 Network effect moats exist when the value of product or service increases for its users as more people use it. At times, the superior value received by users is in the form of a reduced economic impact, i.e., lower costs. Frequently though, it takes a more abstract form like enhanced reach, improved connectivity, increased liquidity, etc. For example, for a marketplace NE moat, a growing number of buyers on the platform improves the value proposition for sellers. In turn, more sellers join the platform, resulting in a wider assortment of SKUs. The consequent improvement in value proposition for buyers kicks in a positive feedback loop causing the network to grow further. 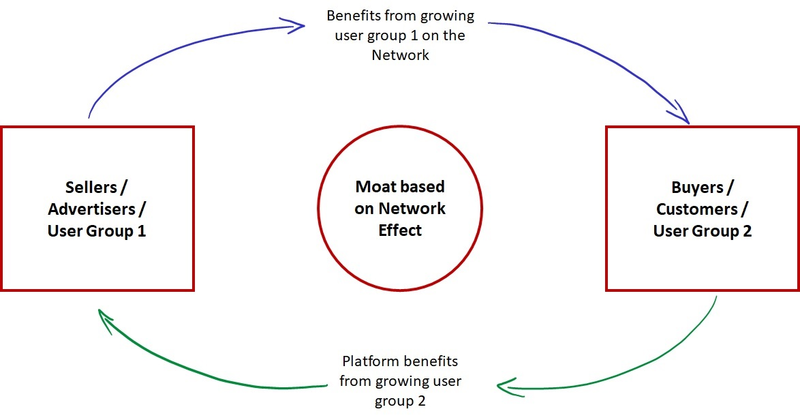 Similarly, for a social media NE moat, an increasing user base improves the social reach of all users on the network. The positive feedback loop associated with all NE moats gives rise to an interesting dynamic. There is a natural tendency on the part of users to gravitate towards the most dominant network. This, in turn, accelerates the dominance of such businesses, giving rise to natural monopolies. It is an important attribute of these businesses as many NE businesses, as they acquire dominance, also become subject to government actions. Figure 1 depicts a typical NE-based moat. Generally speaking, there are two primary nodes to the network1. The product or service is usually structured as a platform offering. While NE-based moats have platforms at their heart, not all platforms create moats. Not all "networks" give rise to NE-based moats. This is an important distinction. In a world rife with digital disruption, analysts are quick to call every platform and/or network a NE-based moat. Later in this article, we will discuss an analytical framework to differentiate true NE-based moats from platforms and networks that do not lead to durable competitive advantages. NE moats are the strongest form of competitive advantages that a business can possess. Frequently, other sources of competitive advantages like economies of scale and switching costs are embedded within NE moats. NE businesses, by their very nature, have highly scalable business models. Indeed, these businesses are a special case of economies of scale with significant operating leverage built into the business model and low operating costs associated with incremental users. As we discussed in our article on economies of scale-based moats, the most important element for such moats is the presence of efficient-production unit (EPU). The EPU dictates the structure of the industry, the extent of competitive rivalry in the industry, and the width of competitive advantage of the lowest cost operator. Much like economies of scale businesses, NE businesses experience declining costs per unit as scale of operations increase. However, they usually possess an interesting trait. For most NE businesses, EPU does not come into play such that diseconomies of scale do not set in. When combined with the fact that most NE businesses are dominant participants within their industries, this attribute endows them with very wide cost advantages over their competition. Much like consumer preference moats and cost of switching moats, NE moats are associated with strong consumer captivity. The continued improvement in the value of the product or service with increasing usage means that these businesses have a natural tendency to become the most dominant operators within their target industry. The larger and more dominant the NE business becomes, the better is the value realized by the users of the network and the wider is the cost advantage of the business over its competition. Consequently, the network acquires significant switching cost properties with its users receiving a poorer value proposition when switching to competitive offerings. The defining characteristic of NE moats is their improving value proposition. The value of product or service increases for all users with increased usage. This primary attribute of such businesses drives our analytical framework as well leading to two critical elements: continued improvement in value proposition and a growing user base. Both these elements themselves are geared towards ensuring that the value proposition and vitality of the network continue to improve. The value offered by the network should continue to improve as network usage rises via more users, more usage per customer, or both. Importantly, the value proposition offered by the network needs to be superior to its competitive offerings; a fact that needs to be easily understood by its current as well as potential users. It is this perception of superiority that is central to ensuring that the platform will be the winner, at the expense of others and will continue to be the dominant platform of choice. The superior value proposition of the network should result in greater number of users adopting its products and services over that of others. Accordingly, the business must continue to see an increasing number of users adopting its network and/or continued increase in usage by existing users. As Buffett's comments highlighted, the reinforcing self-feedback loop creates natural monopolies with Survival of the Fattest. When network effects take over, they create a virtuous cycle; the bigger the network gets, the better is value proposition compared to competitive offerings, and the more users gravitate towards it. And the more users gravitate towards it, the more dominant the network becomes. Figure 2 summarizes the key elements of our analytical framework concerning NE moats. Let's take Amadeus IT Holdings as an example. 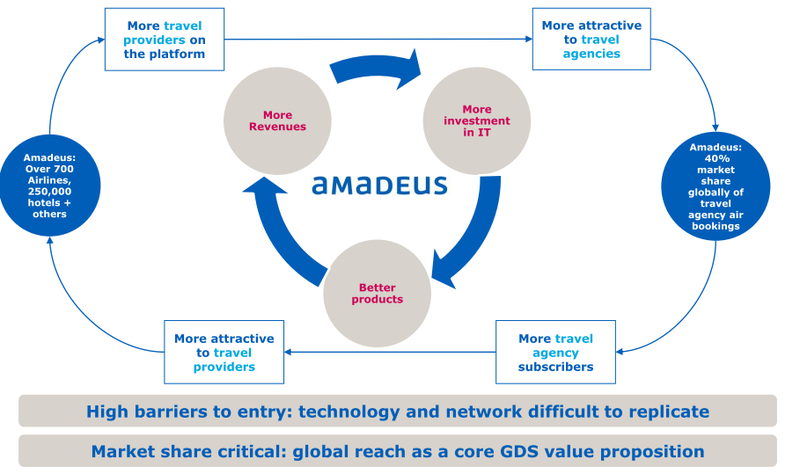 Amadeus is a leader in airline booking distribution with a 44% market share. The company's global distribution system (GDS) platform connects travel providers with travel agencies. As is seen in Figure 3, Amadeus's business is associated with a virtuous cycle. The more the number of travel providers on the platform, the more attractive it is to travel agencies. Similarly, the more the number of travel agencies on the platform, the more attractive the platform is to travel providers. In addition to the primary components of the analytical framework discussed above, the analyst should pay heed to additional factors as discussed below. What follows is not an exhaustive list of ancillary factors. As NE moats are driven by increasing user adoption, any meaningful loss of market share needs to be monitored. Network persistence is crucial for a business with a sustainable competitive advantage driven by NE. The analyst should pay attention to primary driving factors for the network, like number of paid clicks for search businesses (Alphabet and Yandex) and average daily volumes traded on exchange platforms (CME and MarketAxess), number of transactions processed for payment service providers (Visa and MasterCard), etc. The analyst should pay close attention to technological change that has the potential to render the network obsolete. Consider the case of operating systems like Windows and Android/iOS. Before handheld devices came to acquire the computing prowess that modern smartphones have, desktops and laptops acted as the computing devices of choice. This was a world where Windows had absolute dominance. The competitive offerings, even the ones that were technologically superior, failed to unsettle it. However, as mobility devices like smartphones increasingly acquired the status of computing devices of choice for most users, it has resulted in Windows losing its dominance with Android and iOS increasingly accounting for a larger proportion of the total. In some cases, there may be more than one dominant network. This is especially true in cases where users can simultaneously be users of products/services of multiple networks without suffering any significant cost for doing so. Payment-services networks like Visa and MasterCard are good examples of such businesses. In such cases, each one of the dominant businesses will have sustainable competitive advantages from network effects. However, the analyst should pay special attention to risks associated with sharing of networks. if networks within such an industry were to share their network with each other such that users on one network had access to benefits of all other networks in the industry as well, it will likely result in disintegration of moat emanating from network effects. At times, NE advantages are limited to a local area and do not make themselves available to the wider user base of the overall platform. Such a limitation takes effect when addition of a new user in one geographical area does not result in any meaningful benefits to an existing user in another geographical area. Consider the case of ride-hailing services like Uber, Lyft, and Ola. The value proposition of such services improves as local usage increases. However, the number of drivers and riders on the platform does nothing for a rider's experience in another locality except for a limited population of avid travelers. In such cases, it becomes extremely important to understand the boundaries of the network. For such networks, the limits on improvement in value proposition can come into play a lot sooner, limiting the extent of competitive advantage of the business. At times, the boundaries of the NE are limited by local preferences. Consider the example of internet search businesses. 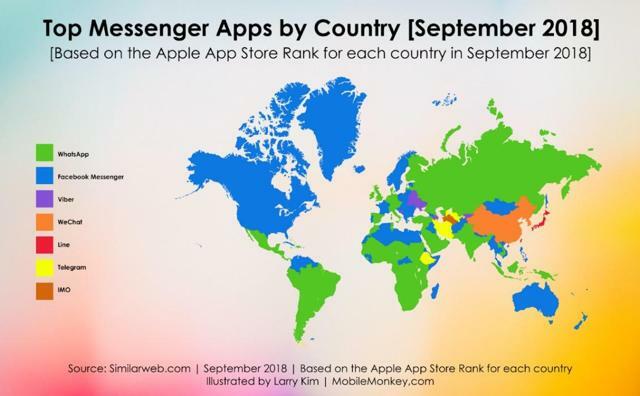 While Google has been adopted by users in most geographies and has acquired dominant market shares in most places, businesses like Yandex and Naver have garnered a 55% and 75% market share in their local markets in Russia and Korea respectively by tailoring their platforms to local language and preferences. Similar effects have also been at play for messaging apps. As seen in Figure 4, messaging apps have generated a region-specific network effect. As discussed earlier, NE moats have a natural tendency to develop into monopolies. Frequently, these businesses, as they acquire dominance and end up with a large population of users, become subjects of regulator interest. At times, such interest results in government actions intended at limiting the reach and dominance of the business. This dynamic is currently at play for networks like Facebook and Google. Application of the framework: MarketAxess Holdings Inc.
MarketAxess (MKTX), operates an electronic bond trading platform. There are over 1,500 institutional investors and broker-dealer firms that are active on MKTX's platform trading U.S. high-grade corporate bonds, emerging-market and high-yield bonds, European bonds, U.S. agency bonds, municipal bonds, credit-default swaps, and other fixed-income securities. MKTX's network of institutional investors and broker-dealer firms represents the widest such network of fixed income market participants. Bond trading has traditionally been a manual process with product and price discovery happening over phone between two parties and being enabled by dealer balance sheets. The lack of central trading facility for these securities makes price discovery a time-consuming process and often leads to poor bid-ask spreads. In this business backdrop, MKTX acted as the disruptor via its trading platform bringing together institutional investors as well as broker dealers, on a transparent network and allowing for direct trading among all participants. MKTX's network received a fillip as regulatory reforms following the financial crisis imposed tougher capital reserve requirements. This resulted in reduced bank bond holdings with inventories declining by more than half as dealers avoided taking on principal risk. MKTX was a major beneficiary of these regulatory reforms which resulted in significant market share gain for the business. MKTX's platform results in significant benefits to users on both sides of its network. In the post-financial crisis world, MKTX's platform allows its broker-dealer clients to stay relevant without the need to hold inventories on their balance sheets. Additionally, MKTX helps these clients broaden their distribution by allowing access to a larger number of institutional investors. Institutional investors using MKTX's platform achieve several benefits as discussed below with value of the network improving as more institutional investors and broker-dealers join the network. Cost benefits. A one basis point (bps) savings on a $1 million face amount trade in a bond with 10 years to maturity translates to aggregate savings of approximately $800 to the bond purchaser. The trading cost on MKTX's platform is approximately 3.2 bps; about half the cost of the traditional process. As the network usage grows, the overall trading costs are further lowered with better pricing. Increased transparency. The trading process on MKTX process, much like other electronic trading platforms, is highly transparent. This is in sharp contrast to the traditional trading process where the investor lacks transparent access to pricing. Improved liquidity and depth. By allowing investors to receive quotations from a larger number of broker-dealers as well as from other institutional investors, MKTX's platform provides much improved liquidity and depth. Open-trading protocol (OTP). MKTX is further improving the value for its users by leveraging its network to promote OTP. OTP allows traders to not only gather quotes from broker-dealers, but also from other institutional investors. By transforming the trading environment from dealers to investors to an all-for-all trading environment, MKTX estimates that it will save its customers an additional 5 bps in yield which equates to about $1,800 per million traded in US high grade bonds. Within the corporate-bond electronic trading market, MKTX is the clear industry leader with a dominant 85% share in investment-grade bonds in the U.S. Figure 5 shows market share of various players within the industry. As is seen, MarketAxess is the most dominant player followed by Tradeweb (NASDAQ:TW) and Bloomberg. Electronic trading continues to gain market share within the overall bond trading market. 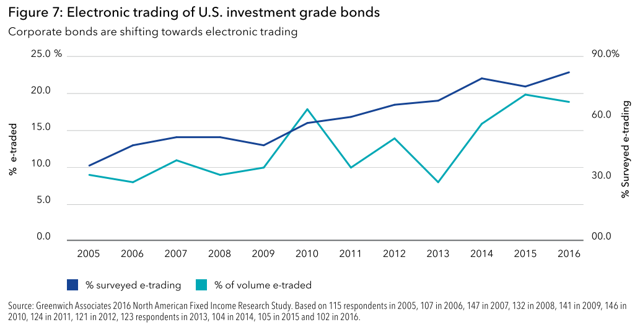 Electronic trading represents nearly 20% of the total investment-grade trading volume in the U.S.; a two-fold increase from 2013. 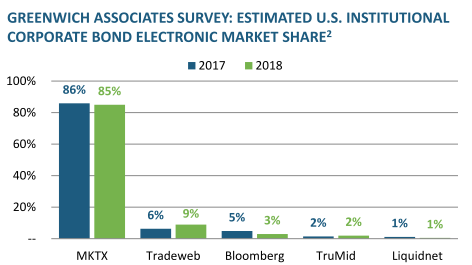 The growth in electronic trading penetration has largely been driven by smaller sized trades with about 70 to 80% of these trades now electronic. Figure 6 provides penetration of electronic trading of U.S. investment-grade bonds. Figure 7 provides the company's estimated share of the overall U.S. high-grade and high-yield corporate bond volume. 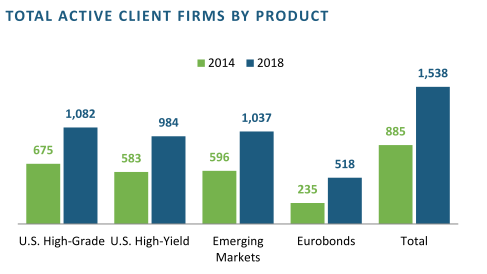 As evidenced by the chart below, company's market share in trading of U.S. investment-grade bonds has increased significantly over the last five years. The value proposition of company's electronic trading platform has resulted in a significant increase in the number of clients on the platform. Figure 8 shows the growth in company's client network between 2014 and 2018. MKTX exhibits continued dominance with persistent growth in traded volumes on the company's platform. Figure 9 shows the growth in U.S. investment-grade volumes executed on MKTX's platform. MKTX exhibits all traits of a NE moat with its network generating significant and improving value for its users. This, in turn, has allowed a near monopoly-like dominance within its target market. MKTX continues to take share of the overall market as users continue to find the value proposition of its platform to be superior to that of the traditional process. However, an important caveat is the limited number of participants on MKTX's network - a fact that is representative of the structure of its target market. The limited number of participants on its network means that the competitive advantage of MKTX's network faces an elevated competitive risk driven by possibility of defections by larger clients. Network effects are the strongest forms of competitive advantages. While these moats have platforms at their hearts, all platforms do not make for NE-based moats. Neither do all networks make for moats. As discussed, the nature of these moats endows them with competitive advantages driven by economies of scale as well as customer captivity. The width of competitive advantages that such moats possess means that these businesses are very hard to unsettle. Yet, such moats are extremely rare. In a world where every other technologically driven business it being touted as a NE business, we hope that the framework we have discussed will help the analyst segregate the true network effect moats businesses from those posing as network effect moats. 1 In some cases, there are more than two nodes. For example, marketplaces have buyers and sellers as their two primary nodes. The third node to such networks develops when advertisers, who are not among the two primary participant groups, start to advertise on the platform.